Olympus PEN E-PL9 KIT with 14-42MM LENS, 16GB CARD and Case - WhiteWe get it. You love your phone. But if you want to be a social media standout, raise your visual game. Introducing the PEN E-PL9. It has everything to produce images you’ll be proud to post. There’s nothing to learn; just pick it up and let the on-screen guides and built-in settings make every shot perfect. Unlike using a phone, your shots and video will look crisp and smooth thanks to our image stabilization system. Compact, stylish and available in a range of colors, it looks as amazing as the photos it captures. Features like a flip touchscreen, built-in flash, and Wi-Fi and Bluetooth for easy sharing make the E-PL9 your go-to camera for shots that will make your friends and followers take notice. The E-PL9 is available in a range of colors to complement your style. The sleek, classic design features materials like brushed aluminum, metal dials, and leather grain that gives it a premium feel. We hid the flash to help maintain its super streamlined look. Even after hours of shooting, the camera will feel comfortable to hold thanks to its ergonomic grip. The compact, portable size fits easily in your handbag or overnight bag so it’s always convenient for traveling and special events. Here’s the secret to shooting amazing photos and video: Let the camera do the work. The E-PL9’s touchscreen provides easy to use assist modes that will capture stunning images in every type of setting. With Auto Mode, the camera instantly detects a scene and chooses the best settings. Scene Modes let you choose from capturing: People, Motion, Indoors, Nightscapes, Scenery or Close-ups. Follow the on-screen prompts to nail the most challenging types of photos. The convenient Shortcut Button instantly gets you back to the home screen for easy operation. Always be ready to shoot a perfect selfie even in low light or in other challenging settings. Simply flip down the touchscreen and the camera automatically activates Selfie Mode for both stills and video. Eye Detection Autofocus locks in on your eyes for the perfect shot. e-Portrait automatically smooths skin for blemish-free results. For instant operation, just tap the subject on the touchscreen to focus and shoot with a single touch. Advanced Photo Mode assists you with high-end photo techniques. Pick from modes like Live Composite for star trails or cityscapes, Multiple Exposure for artistic combinations of shots, and Silent Mode for discrete operation. Use the Art Filter option to preview and compose your shot with one of 16 different filters all in camera. Or, shoot smooth stunning videos in 4K with a simple twist of the Mode Dial, and apply an Art Filter for a unique, creative look. The E-PL9 is a must have for anyone who frequently posts to their favorite social sites. With built-in wireless, Bluetooth and our free Olympus Image Share app, posting stills and video is effortless. That’s because the camera and your smart device form a seamless connection. You can wirelessly send images to your smart device at the push of a button. You can even use your phone or tablet as a remote control, allowing you to get in the group shot too. We get it. You love your phone. But if you want to be a social media standout, raise your visual game. Introducing the PEN E-PL9. It has everything to produce images you’ll be proud to post. There’s nothing to learn; just pick it up and let the on-screen guides and built-in settings make every shot perfect. Unlike using a phone, your shots and video will look crisp and smooth thanks to our image stabilization system. 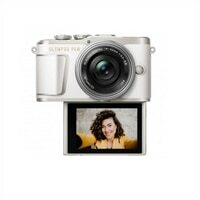 Compact, stylish and available in a range of colors, it looks as amazing as the photos it captures. Features like a flip touchscreen, built-in flash, and Wi-Fi and Bluetooth for easy sharing make the E-PL9 your go-to camera for shots that will make your friends and followers take notice.